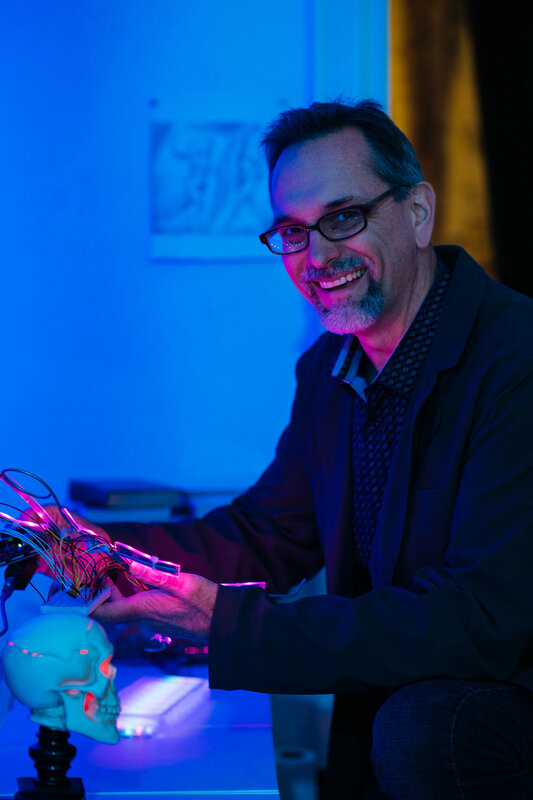 Bent over a jumble of glowing LED strands in a dark studio on Book Hill, Johnny Dukovich looks a bit like a mad scientist. The Pittsburgh native began drawing as a kid, but put his art aside to major in engineering. After the Air Force brought him to DC, Johnny got married, left the military, and moved into software applications. 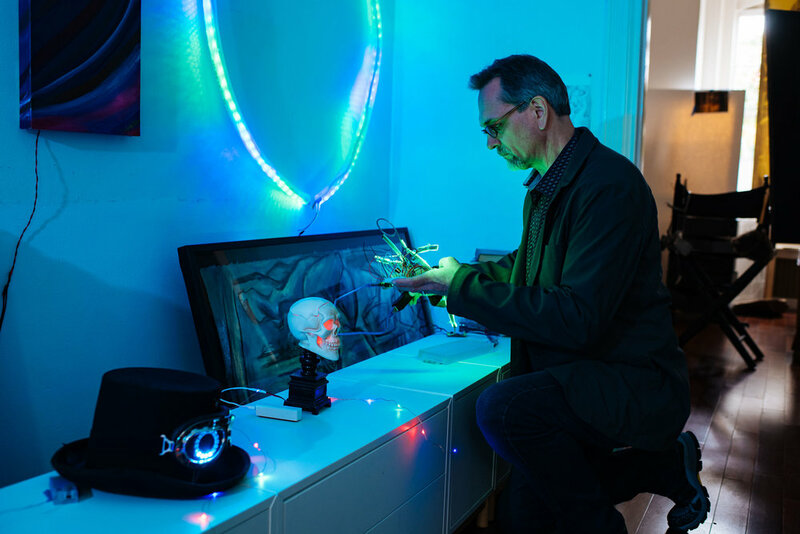 Johnny had been content to draw and paint, but around 2011, he became intrigued by a little device called an Arduino—a programmable, micro controller that can be hooked up to motion sensors. As the price of an Arduino came down to as little as $5, Johnny experimented more—weaving them into paintings, then incorporating sensors. He was drawn to the combination of art and technology, and began teaching classes on the technology. In 2017, Johnny’s preparation met opportunity. 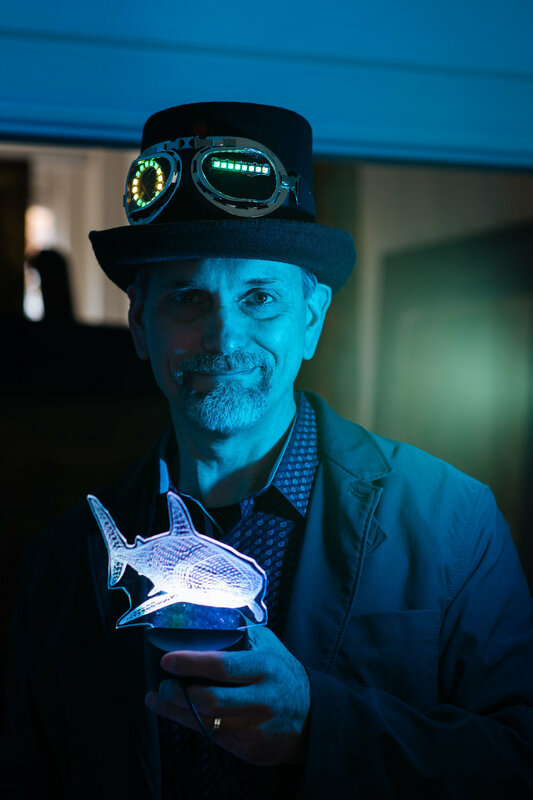 The Georgetown Business Improvement District was preparing for its fourth edition of GLOW—the region’s only curated outdoor public light art experience—and studio owner Micheline Klagsbrun encouraged the Tuesday night drawing group to create their light art to put in front of the Book Hill gallery, with Johnny at the helm. When this year’s official GLOW call for artists was announced, they knew they had to submit. Johnny brainstormed a few concepts with the rest of the group, landing on three, 17-foot interactive figures communicating through Arduinos. Rainbow Friends will be lit nightly from 5 – 10 pm, December 1 through January 6, near the intersection of Wisconsin Avenue and Reservoir Road. One of the looming figures will reside in a tree; the other two on lamp posts. Visitors can interact with Rainbow Friends by tweeting a color (#red, #blue, etc) to @GlowFigure, and watching as the installation’s lighting follows suit. To the average person, that’s beyond understanding. But Johnny insists anyone can learn his craft. So, too, is Johnny’s journey as an artist. He still paints and draws without supplemental technology, but says he’s increasingly drawn to art that encourages interaction. Back in the studio, tinkering with the LED strands, Johnny smiles. He already has an idea for next year.